There are so many reasons why I strongly recommend engagement sessions, but one of the top advantages has got to be the rapport and relationship I’m able to build with my couples before their big day. The story of your life and the loved ones in it starts well before you ever decide to get married, pick out fancy decorations, or don a wedding dress. Why shouldn’t photos follow suit? Engagement sessions are the perfect opportunity for me to gain a better understanding of my couples and their preferences, as well as show them how I typically work behind the camera. Setting these expectations ahead of time is SO beneficial in creating stress-free and relaxed imagery on the actual wedding day. 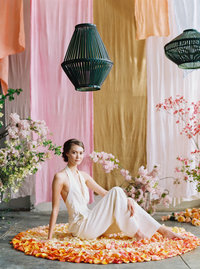 In addition, engagement sessions offer so much flexibility in terms of ideal lighting and timing. A typical engagement session of mine involves thoroughly exploring a meaningful location together, while getting to know each other a little better with every step we take. Without the pressures of a cocktail hour to return to and a room full of guests to entertain, I love watching my clients relax and enjoy their engagement session as we soak in all the calm moments between camera clicks. No matter how many times I get to listen to these stories of almost-impossible meetings and destined romances, I am just as inspired and moved as I was on my very first engagement shoot. Micah grew up in California, but fate drew him to Connecticut for college where he met Chelsea, his bride-to-be. 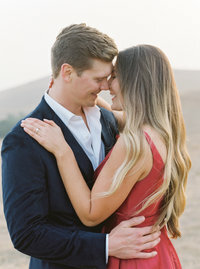 During a Thanksgiving break trip to Big Sur, Micah proposed, and in June, just after Chelsea’s graduation, they will be getting married and immediately moving to Texas. Talk about a busy year! It can already be difficult for couples planning a wedding to take the time out for an engagement shoot, let alone those carrying the additional stresses of school, traveling, job hunting and prepping for a move! But I’ve found that it is precisely the busiest couples that most need the time to stop, breathe and kiss each other in front of a camera lens. Because Micah grew up just down the road from Stanford, we decided to stroll the campus, and it felt as though we were taking a trip through all four seasons. The flowering fruit trees and weeping willows certainly didn’t feel as though we were exploring campus on a January afternoon, and the palm trees by the fountain were as summery as could be, while the tree-lined sidewalks looked like the fall image in a nature calendar. Stanford’s campus can be a beautiful place to shoot, but it is often overrun with students, professors and visitors. On this particular weekday over a holiday break, however, it felt like the campus belonged entirely to us. The magnetic connection between Chelsea and Micah physically manifested in each photograph as they leaned instinctively toward each other without prompting. The uncontrollable smiles on their glowing faces warmed my heart on this chilly California day, and I know Chelsea and Micah will be making each other laugh for many years to come.